Couple of photos emerging now. What do these photos show exactly? Him holding his hamstring and looking uncomfortable. Definitely a hammy but hopefully only a mild pull. So he can't have an opinion? Yes, just thought he contradicted himself from his earlier statement, no big deal, as he said knows more about the type of injury than most, just think it's a case of wait and see and too early for judgements on how long it will takes for ox to be ready for first team action. Hmm, not sure how I’ve contradicted myself seeing as I was echoing what I’ve said all along about him being ready to return for us. But no big deal mate, we all interpret posts in our own ways. All good here. Hammies are a bi*ch to heal. Even in professional athletes with the most advanced and professional care in the world, studies have shown that reocurrence of injuries is always high, and I'm pretty sure The Ox has pulled a hammy at least once in the past (in 14/15). So yeah, this wouldn't surprise me at all. But this is all speculation, and quite pointless. I hope it's just a minor pull and he was just taken off as a precaution. Fingers crossed. Will we see Ox in Europe this year? What is it with you and constantly thinking he will be back within a couple of weeks? seen you say this about 3 times now over the last 6 weeks or so. Can tell you now he won’t be back within 2 weeks, and I know that for 99.99999% sure. To be fair, is there anything about German_Panzer that makes any sense to you? 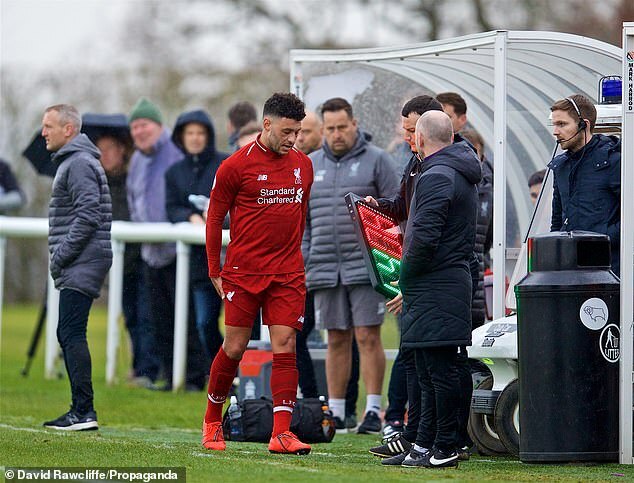 ox is a few weeks away at least, he will probably play a few more u23s games, building up match fitness. As klopp says, so long as no reaction on the knee, its all good. What is it with you and constantly thinking he will be back within a couple of weeks? Because he's in full training? Because he played U23 already? We need him. We will not win anything this season with the midfield we have. And he's been out for the best part of a year. Haha now that’s a suggestion somehow don’t think that’s going to happen . Yet we are sitting 2nd in the League, a point behind and into the last 8 of the CL. ...but we could cruising with 5-7 points lead and in CL we rode on luck (last minute 100% chance of Napoli, Bayern had two 100% chances overall, they use one and it turns everything). If Ox somehow could come back soon and get to top level right away - I know it's slim chance - we could be competitive against top sides without even needing luck. We're gonna be ok lad, we all want him up and running but at the moment, can't see that happening. Thinking early or mid April, if anything. Maybe he will be the guy who gets us over the line, just going to have to let things play out. He pulled up after 40 minutes of the U23 game. and even then he won't be properly match fit until next season. Anything Ox features in this season is a bonus. Stop crying for him to play. Edit: Klopp says he won't be available until after the International Break.